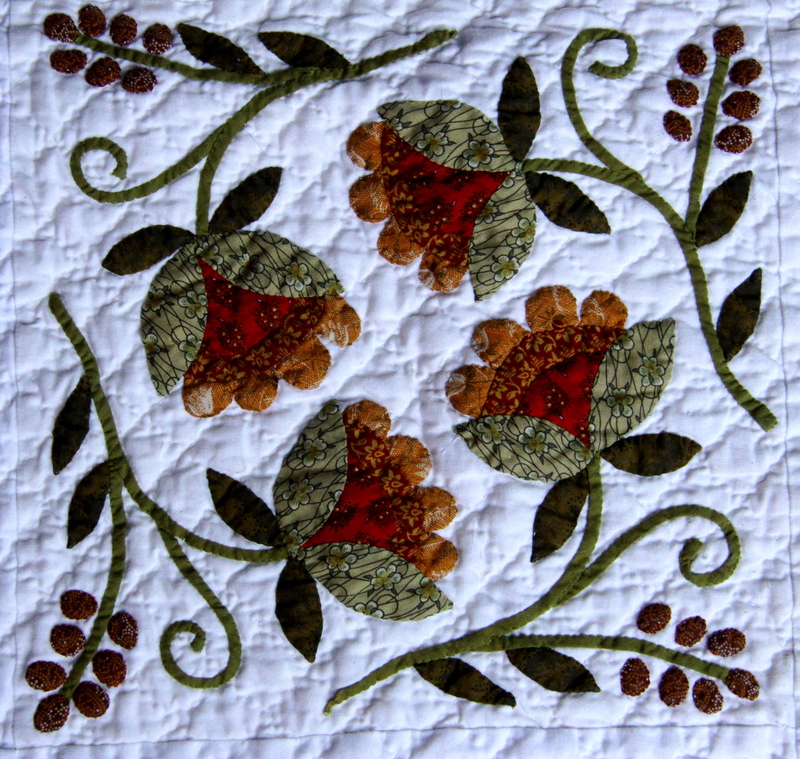 Anyone who has taken a class with me knows that I don’t really believe in all the weird and wonderful notions dreamed up by the quilting industry and I am only particular about a very few things. 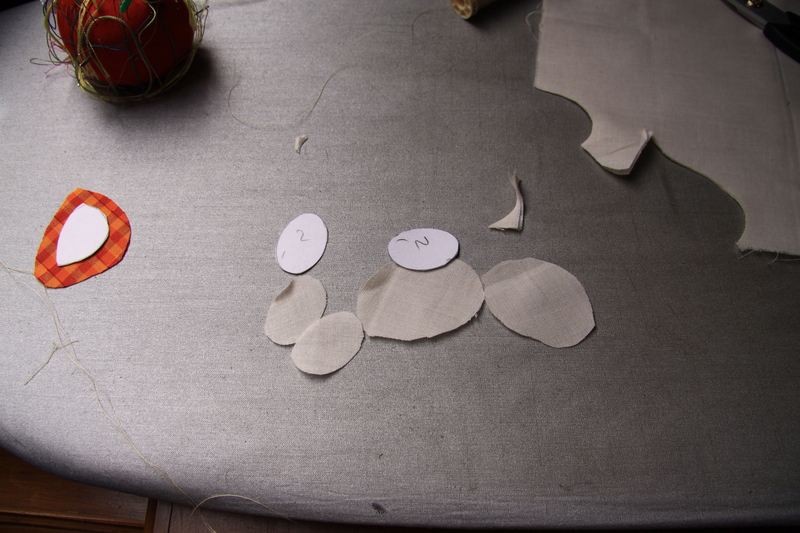 I care very much about batting (Hobbs wool), thread and fabric. I need my rotary knife and cutting board, love my Roxanne Betweens no. 9 and that’s about it. Except for one more thing. I couldn’t live with out freezer paper. 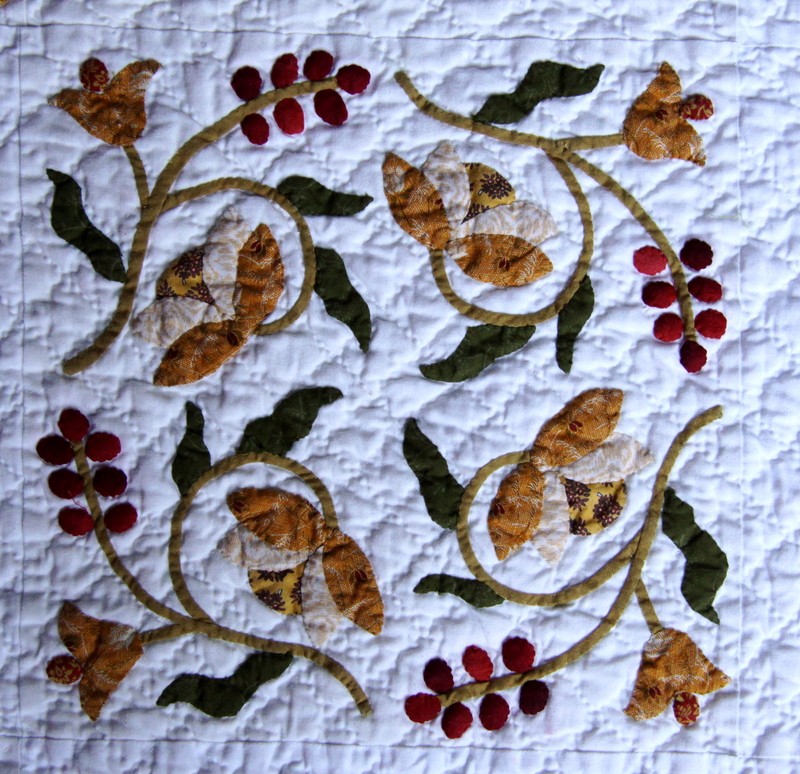 I use it for everything – to draw out new designs, pulling lovely big pieces of it from the roll with gay abandon, I use it for my applique templates and this past week tried something out that worked so well, I wanted to pass it on to all of you. 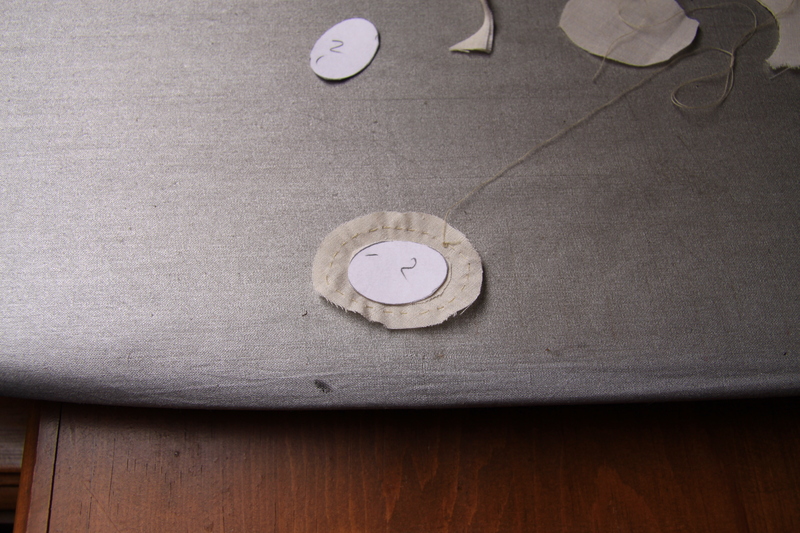 I used to heavily endorse mylar, the heatproof template plastic, as the best material for making templates to gather around and iron for circles and ovals. However, not only is it pretty expensive and hard to come by, for some reason the manufacturer changed it from an easy to see, cloudy, semi-translucent, plastic sheet to one that is completely transparent. Now you can cut out ten small invisible ovals for berries, breathe, and lose the lot on the floor, never to be found again. It’s impossible to see the stuff – I don’t know why they changed it. Card, just the ordinary card bought in printing packs from stationers, that you use in your printer is pretty good but you can’t trace through it. Not only that but even though it is just stiff enough for smaller pieces, you can’t re-use the templates more than a couple of times before they get too floppy. Cereal box card is great, but how to trace perfect circles and ovals on to that? Daa daah…. Freezer paper. I discovered an old drawn out design last week and given that Autumn is upon us, decided to take a break from my other projects to run up this 24″ Autumn Wreath. As it was already drawn out life sized, I could make the templates straight from the drawing. 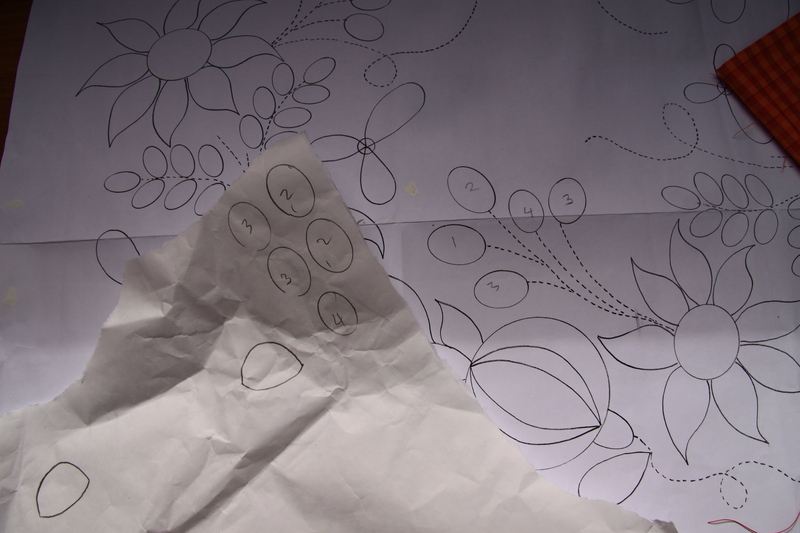 I already had bits of torn freezer paper everywhere to draw out the templates for petals and leaves. 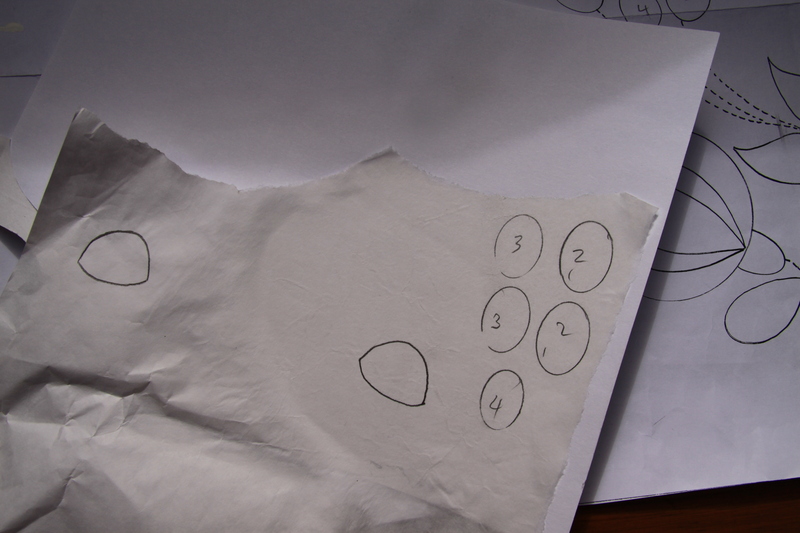 Experimentally I also drew over some of the circles and ovals. I then ironed this freezer paper onto the usual printing card I had and was pleased to see that the two fused beautifully. And I mean beautifully. The card was perfectly crisp and hard. 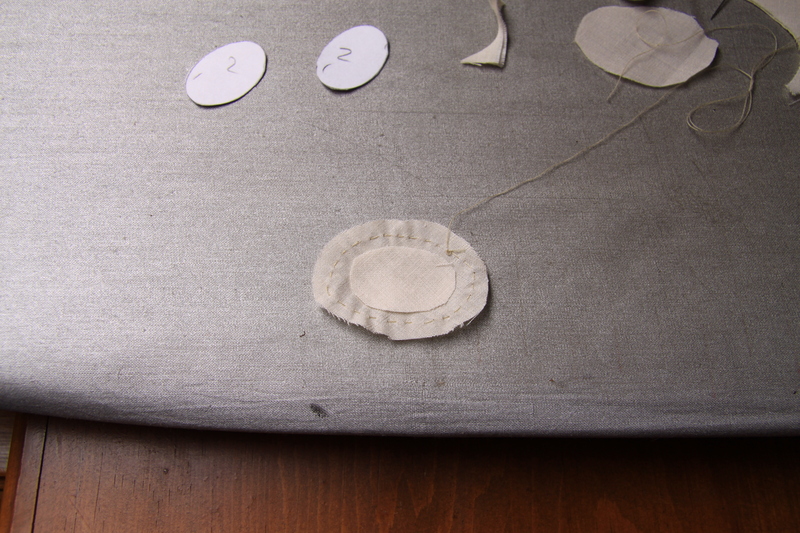 The circles were so easy to cut out from the freezer paper/card mix. The result is a perfect weight and makes a fantastic template that you can re-use several times. It even worked well for the large circle of the pomegranate which needs quite a substantial, stiff template for such a large piece. The freezer paper also seems to add a sort of waterproof layer so that when you use the steam iron, the template doesn’t get soggy. It really works. Try it. 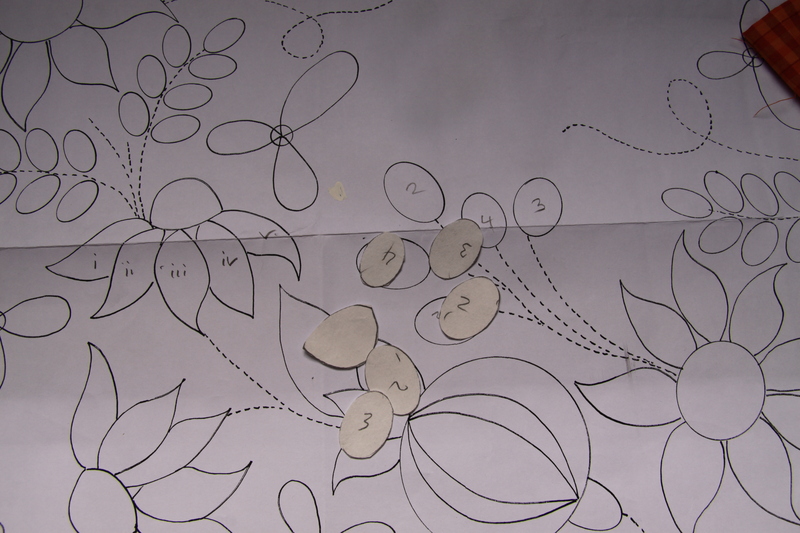 I went on to make some off white ovals for branches of honesty but as they are going onto a very dark background they needed to be interfaced like this…. 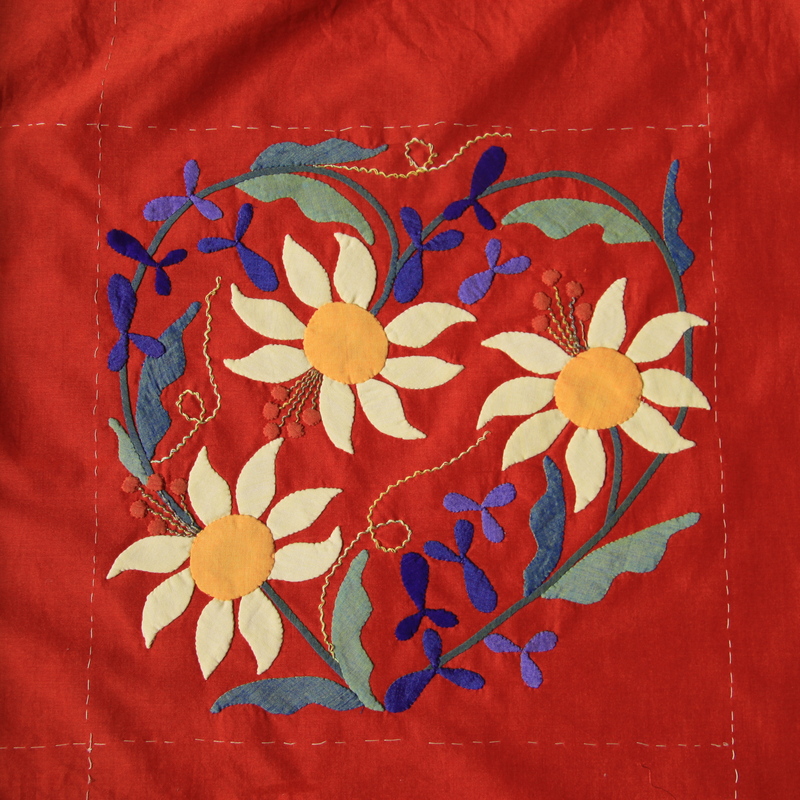 When in need of a bit of tlc, I find I always revert to using red background for my applique. All colours sing off red and their contrast puts me in a great mood whatever chaos is going on around me. I have a distinct memory of my school art teacher telling me that you should never put red and pinks next to one another. Whether it is a change in the times (look at all the clashing reds and pinks in the fashion world) or my better understanding of colour, I would disagree with her and say, on the contrary, you can put any colour next to red and it will work to the benefit of both. Red functions as a neutral and, for me anyway, it has a positive effect on all the colours that sit next to it. Greens are greener, blues glow and pinks shock. 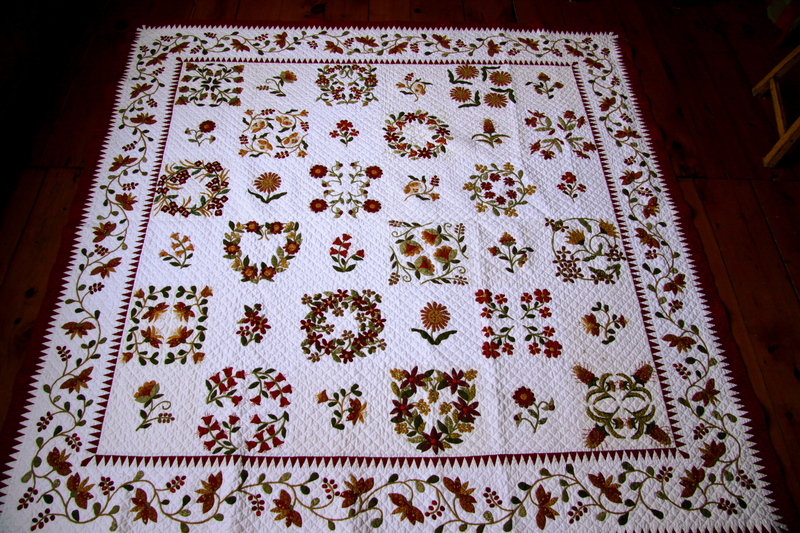 My house is full of red – quilts, sofas, carpets and now that autumn is upon us I love the extra warmth they bring. 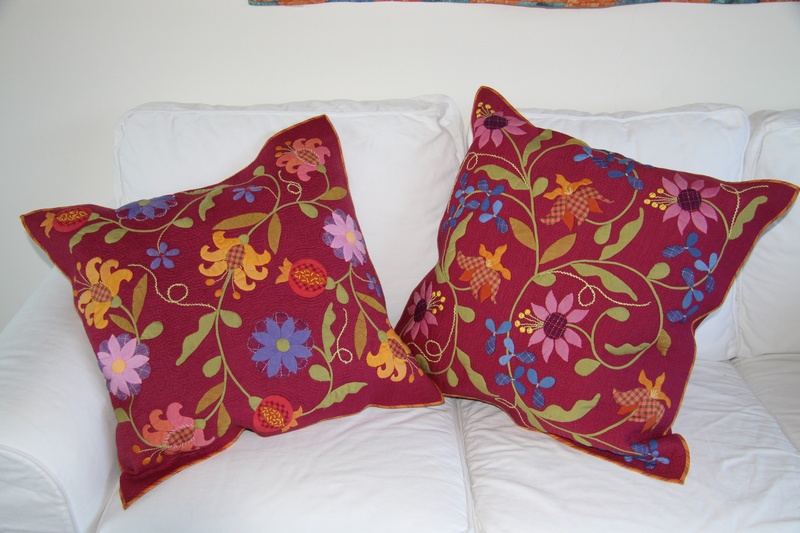 Whilst looking through my photos of past work last week for a bit of inspiration, I came across this photo of the deep pinky red cushions that I made as a present for my eldest son and his partner, thinking they might work in their cottage. 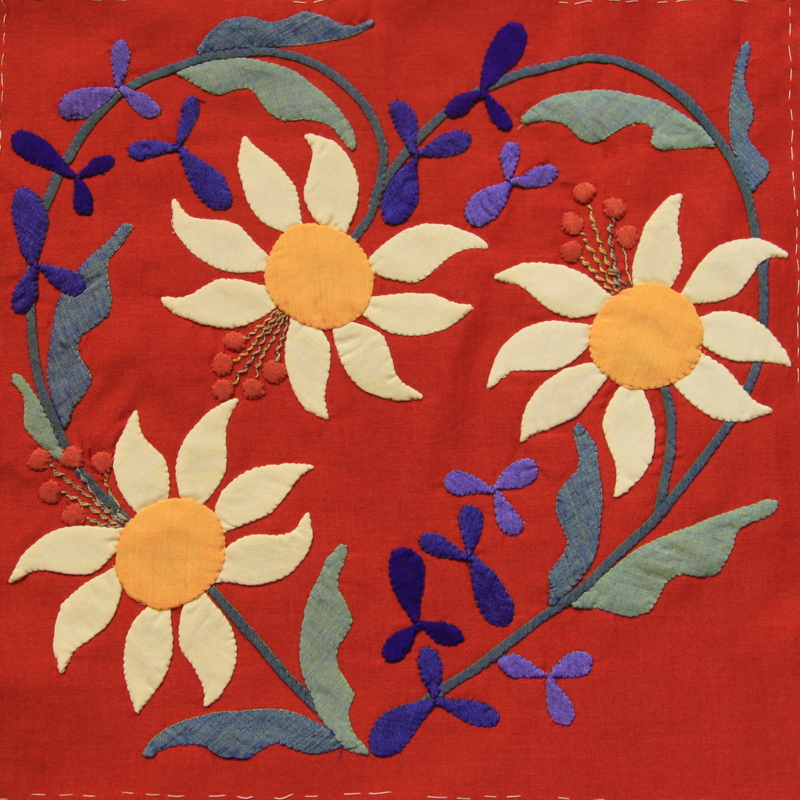 They were an experiment to see whether it was possible to sew my classic floral designs with plaids. It seemed a great home decorating idea for a couple of trendy guys with lots of style – classic floral but with more masculine plaids thrown in. I gave it a shot and it really worked. Rediscovering this photo now I’m tempted to go the whole hog and try a full size bed quilt in the same vein. Just imagine how gorgeous that could be…. 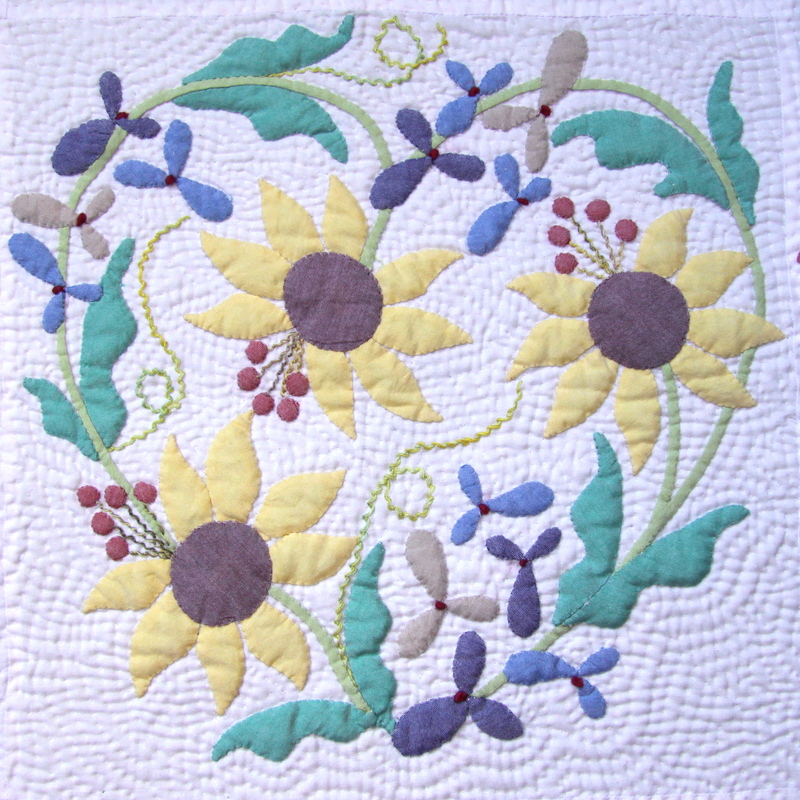 My flowers reappear in new projects all the time and the three petalled flowers and sunflowers in the cushion on the right above appear together in my new Sunflower Heart Block in Floral Impressions. I worked so hard all last week correlating all of the paper patterns, templates and instructions for the BOM send out and I’m confident that they’re water tight. But so that I can sleep at night, worry free, I had decided to work the entire quilt again using only the patterns, instructions and templates that I will be sending out to everyone as of next month. And just when I had decided this, my best friend the FEDEX man knocked on the door. Brilliant parcel. Best ever. I had asked Michael if he could send me some of his Cadiz ruby red to back my, oh so very nearly finished purple applique quilt. But, lucky am I to be so favoured, Michael sent me two complete lengths so, just like that, abracadabra, the background fabric for my re-make had magically appeared. It is so sumptuous, so gorgeous, it defies belief. When you shake the whole length out, the light reflects off it in a way that I have only ever seen before in a silk. Drop dead gorgeous. Ruby Red shot through with vivid orange. Incredible. That evening our son Max was busy working on a bit of sound editing for his music, totally engrossed, wrapped up in headphones and cables in the kitchen. I appeared at his side and just flung open the length of Cadiz. I wish I could do some time lapse photography, I wish I could capture the Cadiz glow, but it seems I’m lacking in that department. 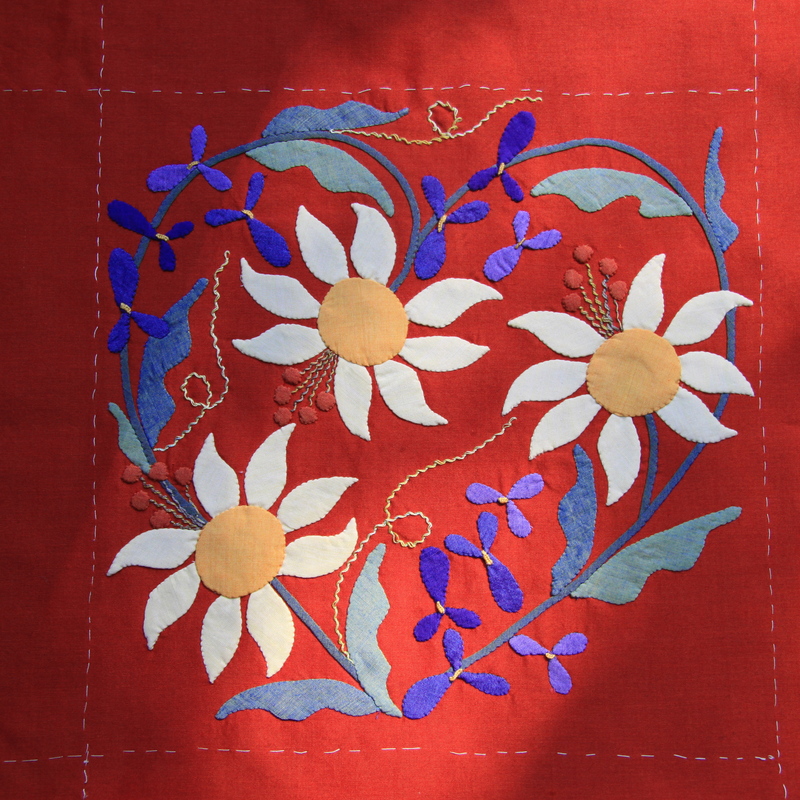 Instead here is the block finally coming to life with each bit of embroidery added…. I’m hoping that next week I might be able to manage to bribe Gus to do some video recording for next week’s blog. 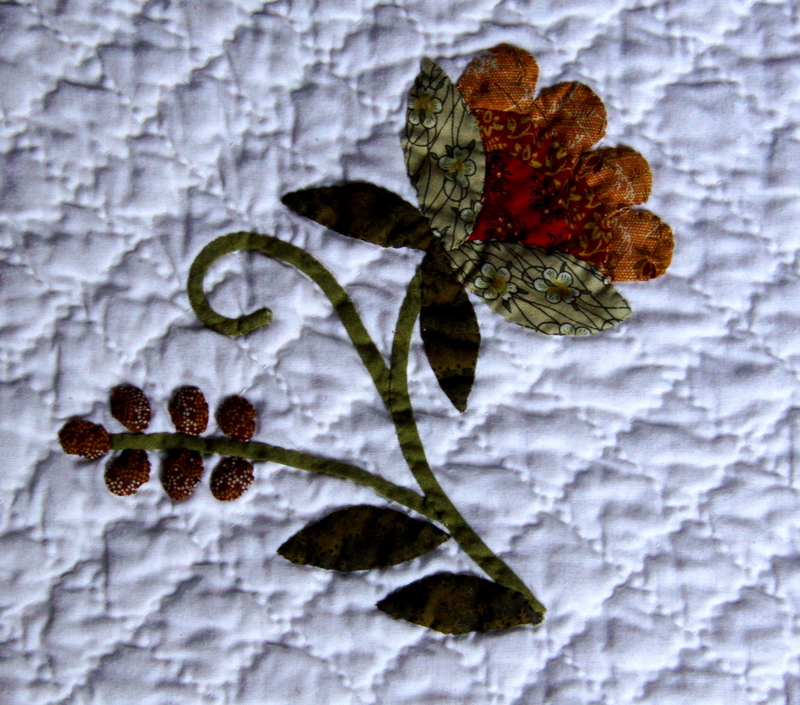 I see that I can upload a video with this new blog site so perhaps the time is right for some hand applique demos before you all get started on your BOM next month. Fingers crossed that son, camera and computer all co-operate. 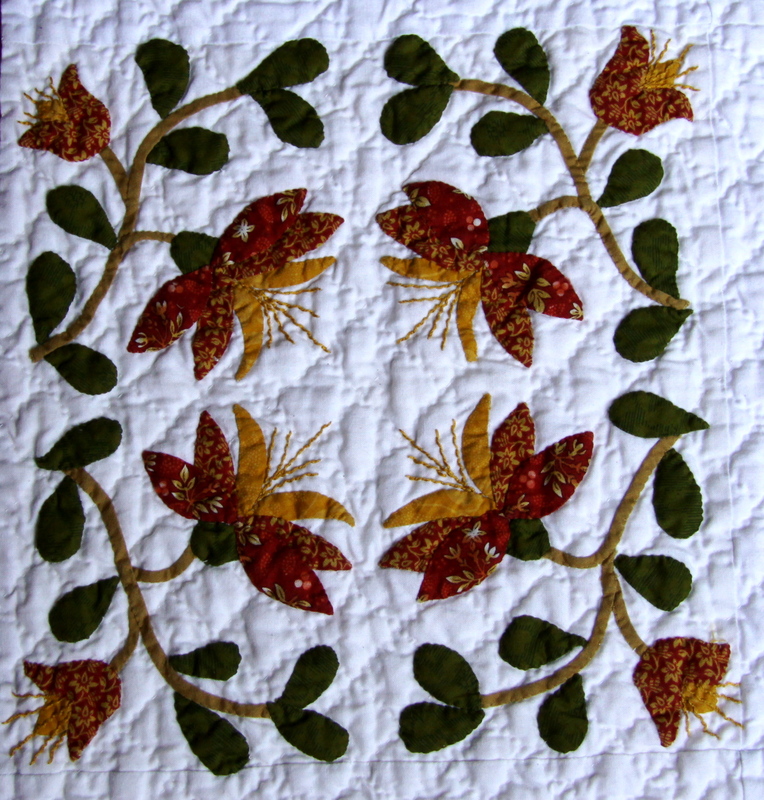 I had intended to write about the Floral Impressions Block of the Month tomorrow but I have received so many e mails about where and when to sign up that I think we’ll go global today. 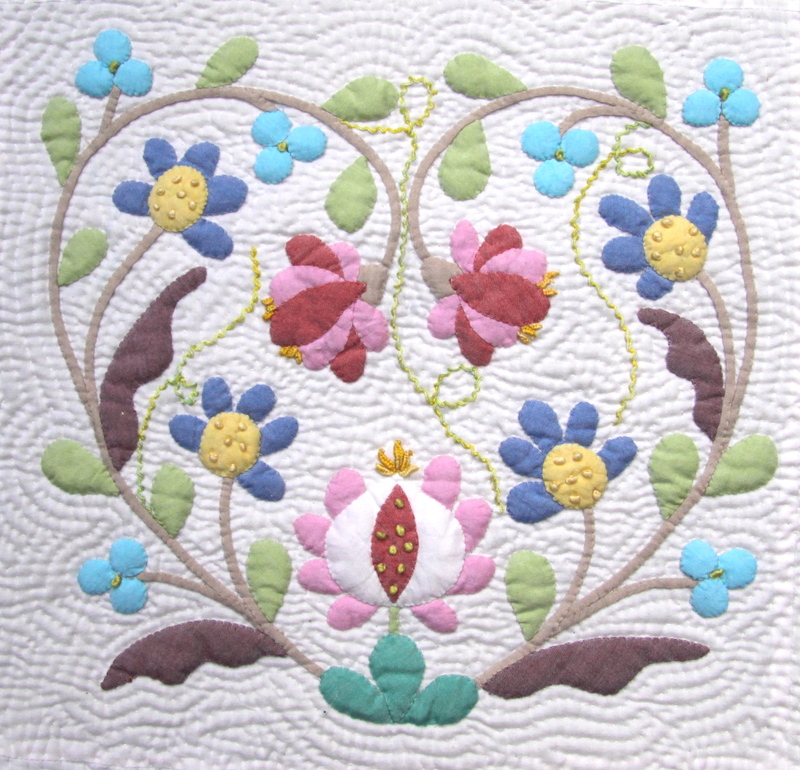 Floral Impressions measures 54 ” square and uses the new Impressions range of shot cottons from Oakshotts. 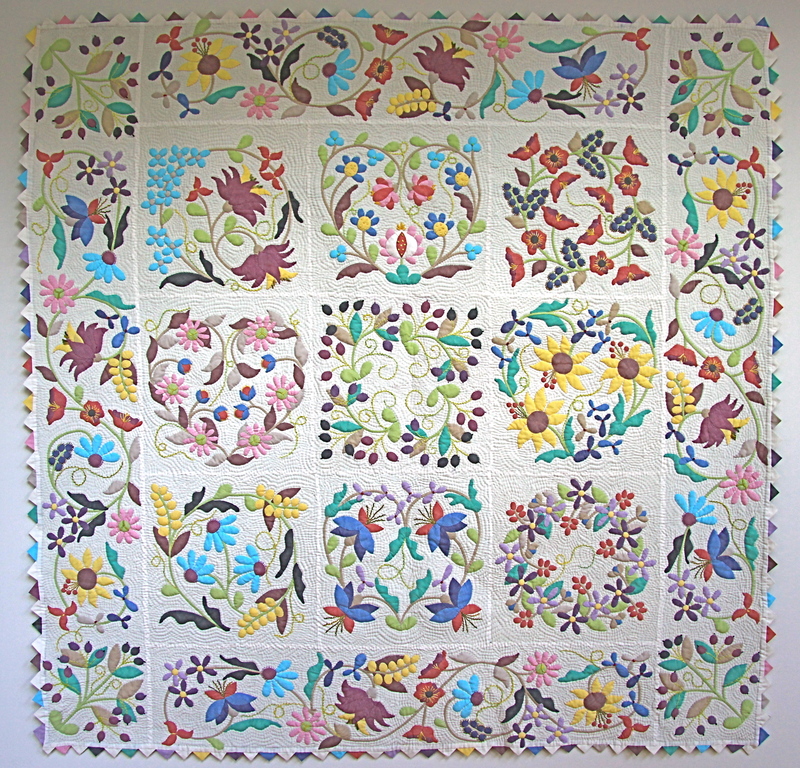 It has nine central blocks and four borders all of which would be gorgeous projects in their own right as pillows, runners or wall hangings. 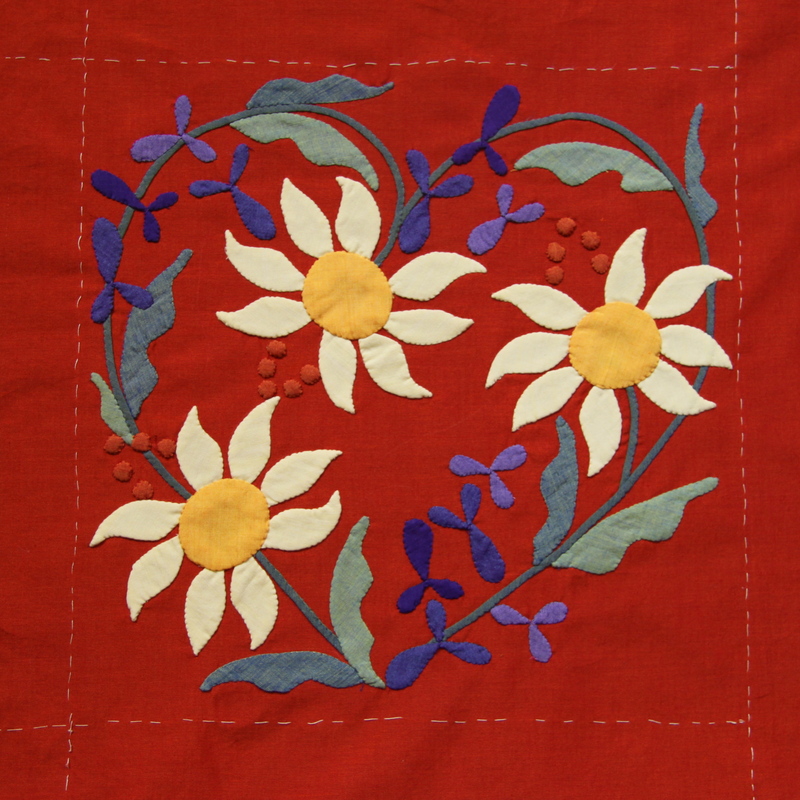 Each of the central blocks measures 12 ” square and each is either a heart or a wreath of flowers. Here are a few close ups to whet your appetite….. 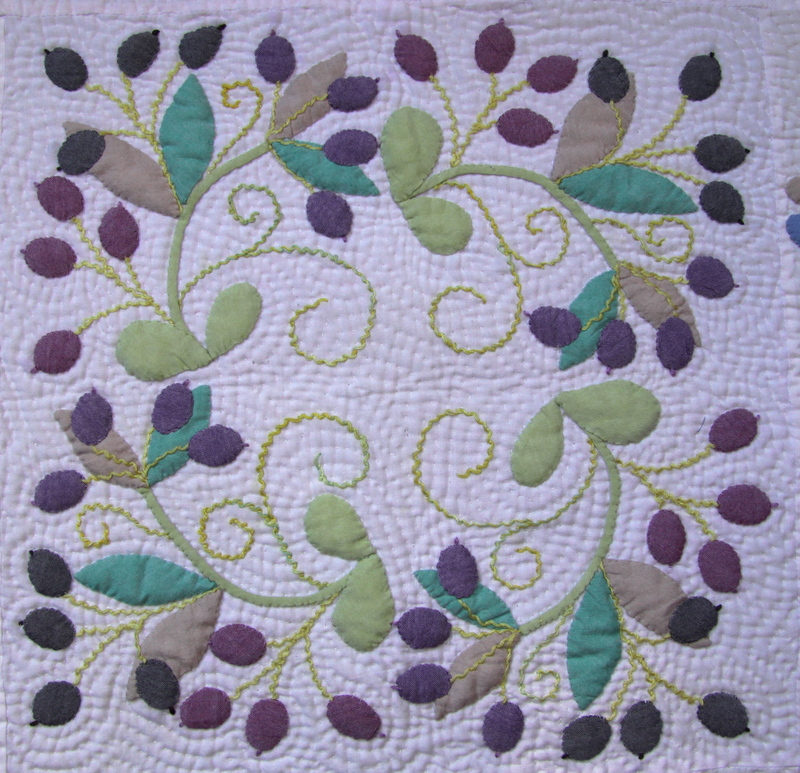 The nine blocks are surrounded by floral borders with olive trees in each corner. I’m proud to say it’s an all new design and not available in my book or pattern pack and it is only available from Oakshotts this year while stocks last. The Block of the Month will last for one year and starts at the beginning of next month, October. You will receive the pattern and instructions free of charge every month once you have bought the fabric required from Oakshotts. That’s all you need to do to qualify for the free pattern throughout the year. Simple. You can either buy the whole pack comprising of 16 fat quarters plus background fabric to replicate my quilt exactly as above, or buy the half pack, made up of just the fat quarters leaving you free to choose your own background. Go to…. Sign up today! It’s going to be a lot of fun! 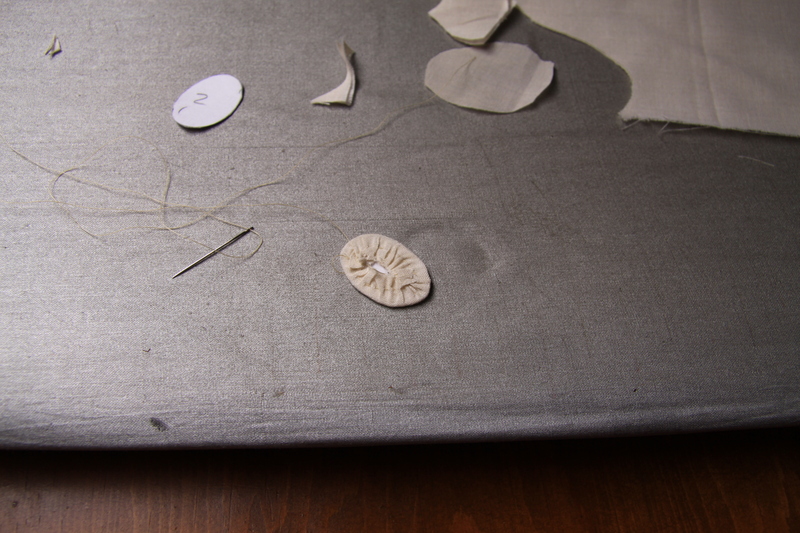 It’s been a busy week with little time to sew. 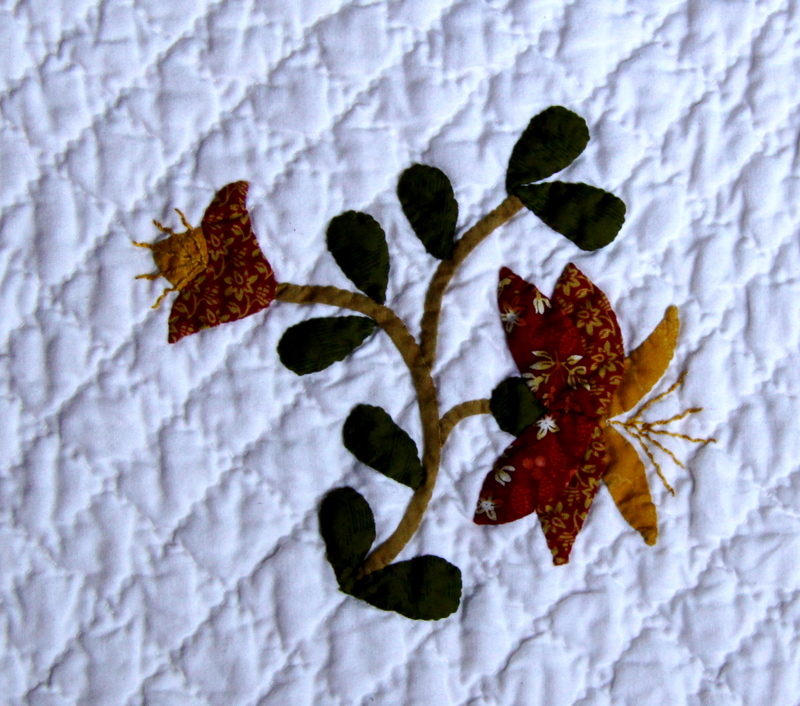 My local quilting Guild had their two opening meetings this week and it was so good to be back amongst other fanatical, slightly barmy quilters. Our Guild has over 100 members and though I say so myself, it is just full of amazingly talented, artistic and creative men and women. I come away from every meeting newly inspired. Gus also had his braces fitted, top and bottom, so needed lots of extra tlc. We watched a lot of tennis to distract from his aching jaws and I managed to sew one 12 inch block for one of my parallel projects. 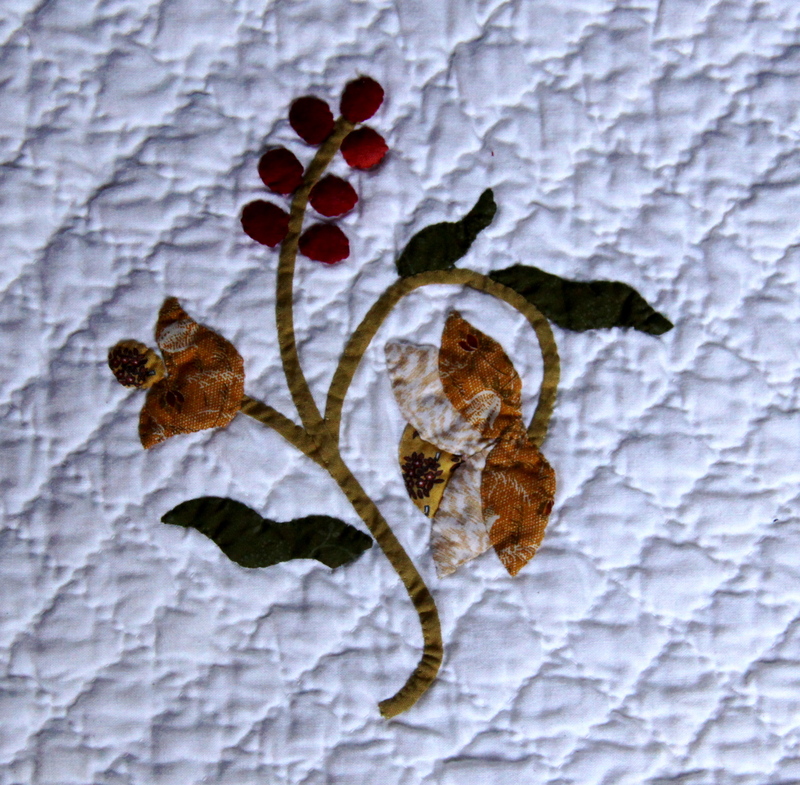 For this project I have been working on a whole batch of new flowers and in order to (a) practice them and (b) have a full sized bed quilt for my next book I have gone back to a quilt I designed in 2005, my first ever attempt at an applique quilt. I have decided to replicate this idea using the my new wreaths and hearts from my new Floral Impressions quilt along with these new flowers. 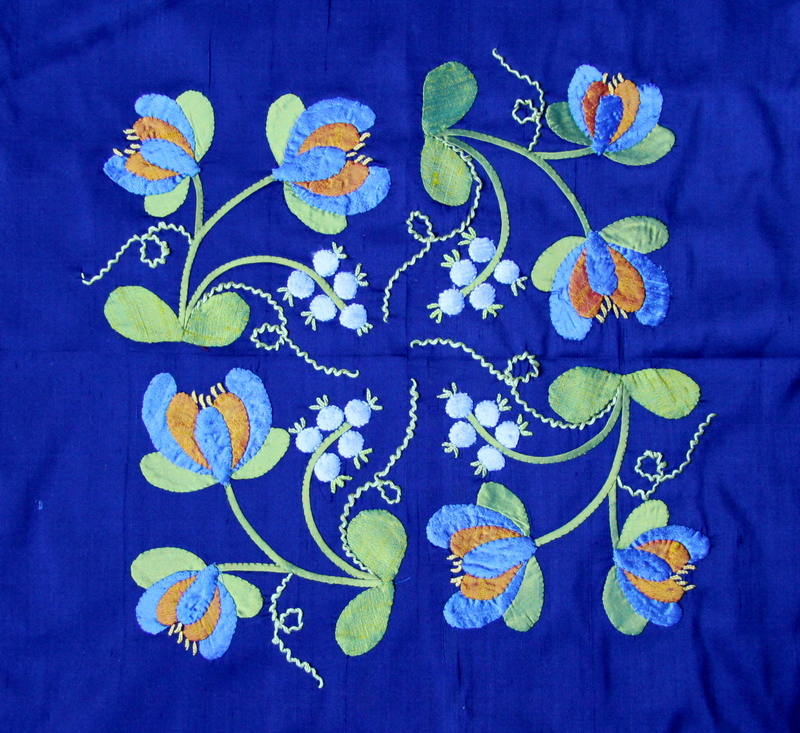 It will be a totally impractical bed quilt, being created in silks, on a navy blue background to use up the yards of navy blue silk I bought in mad moment years ago. I’m hoping this quilt might just finish off all my silks once and for all. 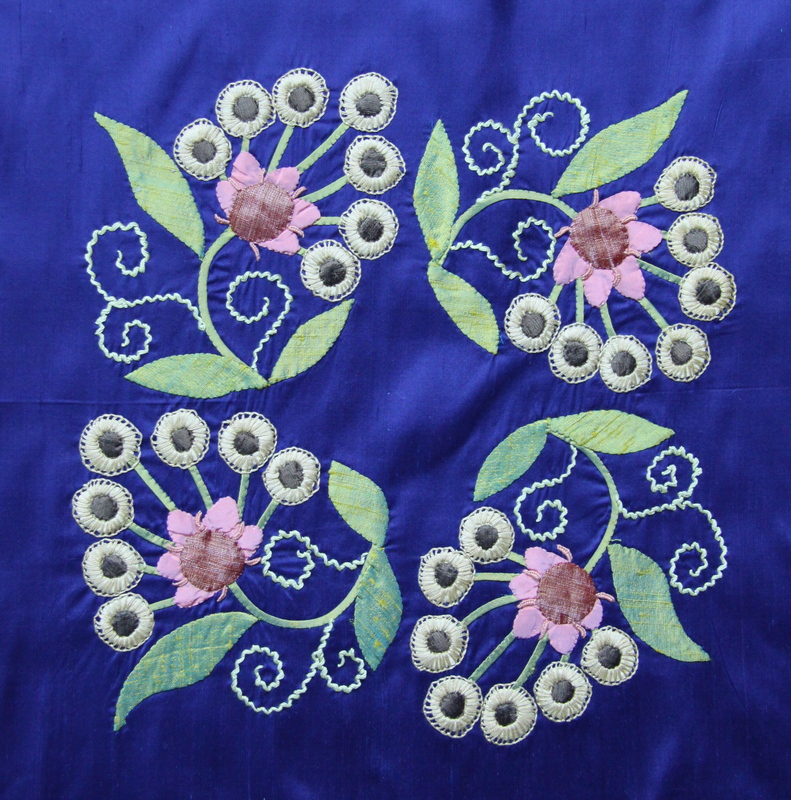 Here is one of the new flowers I worked on this week along with some pale blue blueberries (unripe perhaps). And here are some particularly loopy flowers I made earlier this year in a moment when, if it were not for the fact that I’m older and wiser, you might think I created under the influence of something hallucinogenic. Actually, joking aside, I really love these flowers but have no idea what to call them. 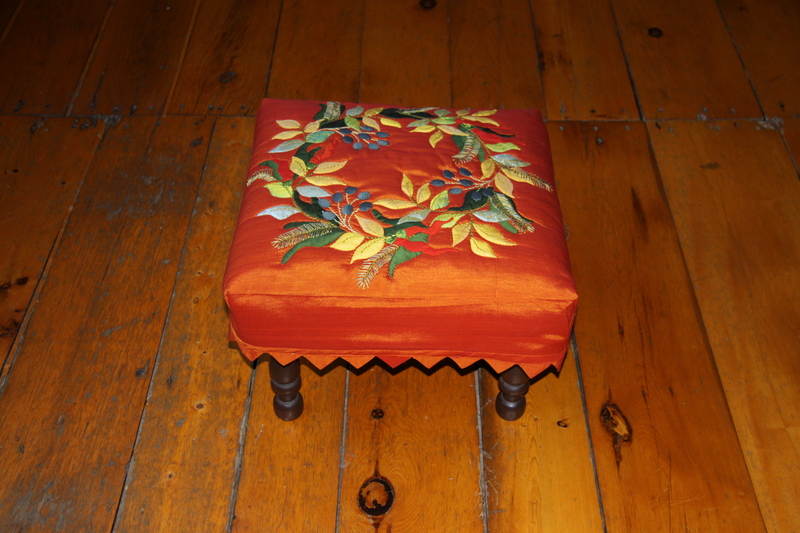 I finished last week’s Chilli Pepper Wreath too – I just echo quilted the applique and then made it into a footstool top but if anyone puts their feet on it they will be shouted at. It works quite well especially with the prairie points edging. It’s a bit of decorative nonsense that cheers up the hallway.